FREE SHIPPING ON ALL FISH MOUNTS. FREE SHIPPING. 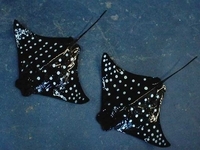 This is for one 20" Spotted Eagle Ray Half Mount Fish Replica Taxidermy. A very unusual replica, but very interesting as well. This is a 20-inch half mount replica of a black eagle ray. These mounts look great in pairs of like mounts or with a larger mount of the same type. Estimated time for shipping is about 2-3 weeks.